Great Movie, wish there was more like this! 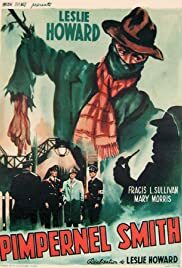 "Pimpernel Smith" is one of the most classic movies you will ever find in the World War II era. It will ever serve as a reminder that in 1941, the world did indeed know of the existence of Concentration Camps. It will further be a testament to the murders committed there with the statement by Dr. Benkendorf (Allen Jeayes, excepting Leslie Howard, the only man to play in both Pimpernel movies) "My business is to cure, not to kill!" What makes this movie is not the plot, but the little subplots that surround the movie. You cannot watch this movie just once; it takes several times before you catch all the subtilties. Leslie Howard is just full of them in this movie. But even more interesting is the character development. We watch Professor Smith go from a hardened academic to a gentile, but compassionate man. We watch the students go from being boys to men, and we learn from Ludmilla Koz about what kind of courage a lady can have. By all means, watch this movie and watch it a lot. It will teach you in many ways.